Nvidias mobile plans. 1.5 ghz quad core. Ben. A leaked NVIDIA roadmap reveals that the graphics chipmaker is working on two new additions to its Tegra line of ARM-based chips: the Tegra 2 3D, and the Tegra 3. The Tegra 2 3D is a 1.2GHz version of the recently unveiled Tegra 2 chip, but with added support for 3D displays. Given the number of prototypes we've recently seen for glasses-free 3D on a small screen, it's no surprise that the company is including explicit support for 3D output (glasses-free or otherwise). The only really interesting twist to the news is that, like the rest of the Tegra line, the 3D chip will come in both phone and tablet flavors. There's no indication whatsoever that the Tegra 2 3D will be included in any sort of 3D tablet, and, indeed, we aren't even aware of any such tablet being officially announced by anyone. There have been rumors on multiple sites that LG will produce a 3D version of its upcoming, Android-based G-slate tablet, but these remain unconfirmed. 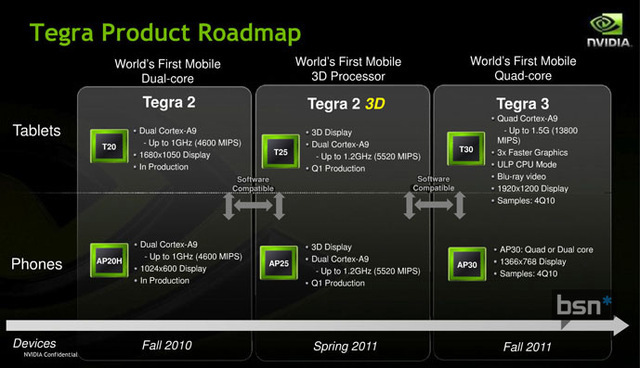 But given that G-Slate uses Tegra 2, though, the leaked roadmap slide adds a bit of weight to the rumor. The other chip on the leaked roadmap slide is the Tegra 3, a 1.5GHz beast of a chip that will have four Cortex A9 cores and an improved GPU; regarding the latter, the slide claims a 3X improvement over Tegra 2's already solid GPU performance. The tablet version of the Tegra 3 will add support for Blu-ray and 1900x1200 output. Along with an ultra-low-power mode, it looks like NVIDIA may well position this chip for use in both home theater devices and laptop-style portables. In other words, Tegra 3 could pave the way for Project Denver, which isn't due out for some two more years. The smartphone version of the Tegra 3 will come in quad- and dual-core flavors, and will support a lower display resolution (1366x768). BSN appears to be the source of the leaked slide, and the site is reporting that the Tegra 2 3D will drop in February, while the Tegra 3 will come in the fall of this year. Given that the G-slate is rumored for a February or early March launch, my guess is that we will indeed see some a 3D version of the tablet that uses the Tegra 2 3D.